A primer in case Darkwing Duck was never part of your particular Disney afternoon: It’s a spinoff of DuckTales that has Scrooge’s pilot, Launchpad McQuack, leaving Duckberg for St. Canard, where he plays sidekick to the Batman-like resident superhero. 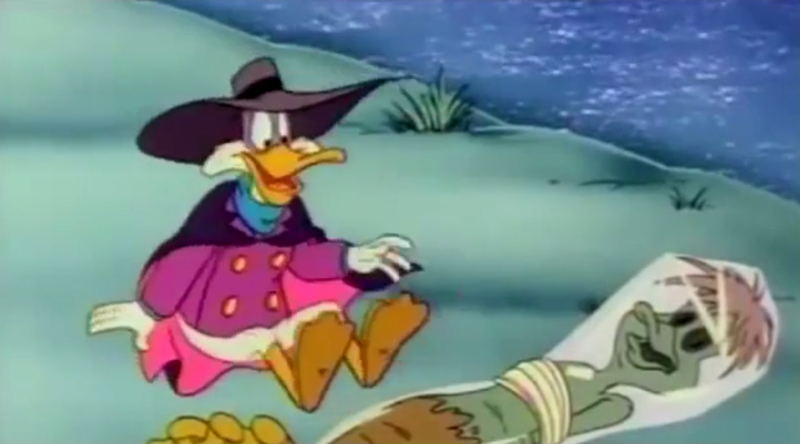 The plant-duck-thing you see at the beginning of the clip is Dr. Bushroot, who’s basically the Poison Ivy of the Darkwing Duck universe. The first especially Twin Peaks moment occurs just after the one-minute mark. That background music doesn’t occur anywhere else in the series aside from this episode, unless I’m mistaken. It sounds just like the darker parts of “Laura’s Theme.” Around the two-minute mark, you hear even more riffs on Angelo Badalamenti’s music, and the “Twin Beaks” theme is close enough to “Falling” that it puts me in the very same relaxed mindset, knock-off status notwithstanding. I don’t think the character name Trudi is coincidental: Though Norma owns the diner, there’s recurring Twin Peaks character named Trudy who works as a waitress at the Great Northern. Giving Trudi Nadine’s eyepatch is actually a fitting way to further tie Norma and Nadine together, really. Around the 2:40 mark, you see Dr. Bushroot’s dried up body wrapped in plastic and tossed into the river. Even understanding the source material, I have to admit that this is an oddly dark moment for a Disney cartoon. Would you have expected that a series that exists in the DuckTales universe would so directly address the topic of death? And corpses? The musical effect that accompanies Bushroot’s corpse falling into the river is oddly lighthearted and whimsical. This may have been intentional. I like how Darkwing ultimately offers a more concrete explanation for a talking log than Twin Peaks ever actually did. I also didn’t realize while watching as a kid that Darkwing himself is kind of jerk to his friends. He just has the crankiest responses. Two thirds of the way through, the episode takes a sharp turn into B-movie sci-fi, Invasion of the Body Snatchers-style, which isn’t any weirder than anything else that happens in the story, really, and which may have resulted from the writers didn’t have an ending to Twin Peaks that they could trace their way to. (Really, we still don’t, all these years later.) I suppose it does tie in well enough with Twin Peaks’ theme of doubling. 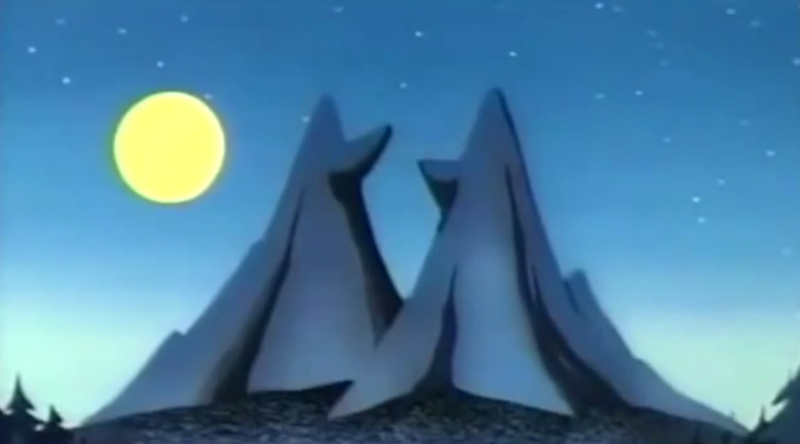 Darkwing’s dream sequence isn’t particularly David Lynch-inspired, but it is weird as hell. I say that in a good way: It’s always good to see unbridled lunacy in something that kids watch. And then in the end, the warning “The cows are not what they seem” is explained away by having the Earth’s saviors be alien cows, who arrive and blast in the cabbage clone menace with lasers. Maybe the weirdest thing of all in this episode would have to be the revelation that the spacecows come from “the planet Larson on the far side of the galaxy,” which is nod to Gary Larson’s cow-populated Far Side comic that gets wedged into the episode despite the lack of any tie to Twin Peaks. Again, I’m not complaining: I actually got this reference when the episode first aired, and it made me feel smart. I’m pretty sure those dual-beaked bird puppets would have given me nightmares if I’d seen them as a kid. And in case my abbreviated Twin Peaks wasn’t enough for you, you can watch the full clip below. Gosalyn is just the best name for a female duck character. I was definitely in the camp of "Okay, I've heard of Twin Peaks, and...?" when this came out.